What would Love Week be without having some friends around? Michelle Clement is a gifted illustrator, designer and crafter. She has a bright and playful style that you can't help loving. I invited her to share something here, and when I heard what she was working on, I audibly gasped. Seriously! So please welcome Michelle, and show her some love! This is Michelle from Scissor Quirk, with a super-sweet Valentine's crafty freebie, today, just for you! Aah. Valentine's Day! I love when this super-cute holiday rolls around, every year. It makes me happy. I mean, I doodle things with hearts on them all year, gather the cheesiest of all cheesy love cards for my husband in anticipation, and wish there were cinnamon hearts year-round. :) It really is lovely. Also lately, though, I have been gathering and loving piles and piles of old beautiful doilies, too - not just Valentines cards! Knowing how much love and care went into making them, they seem more like little Valentines, on their own! 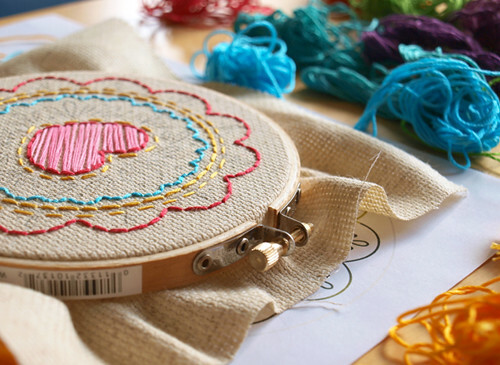 Which gave me an idea - why don't I embroider a doily? Cute, no? Two of my favorite things, rolled into one! 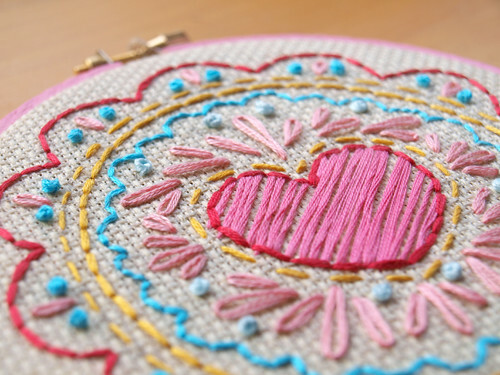 So I created this free Valentine pattern for you, 'Love in the Middle' - cuz that's where the heart is! You can download it right here. 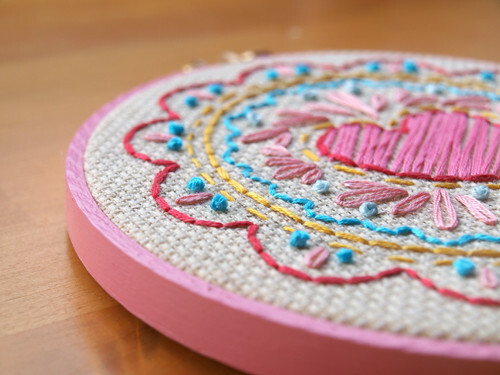 I think it will make a lovely edition to my craft space (under my heart garland, of course), but how cute would it be to give one your crafty Valentine friends or display at your pink cupcake party? Thank you so much, Michelle! I'm so in love with this pattern, and can't wait to start stitching! For more of Michelle's sweetness be sure to check out her shop...you'll love these embroidery patterns! this is so sweet!! 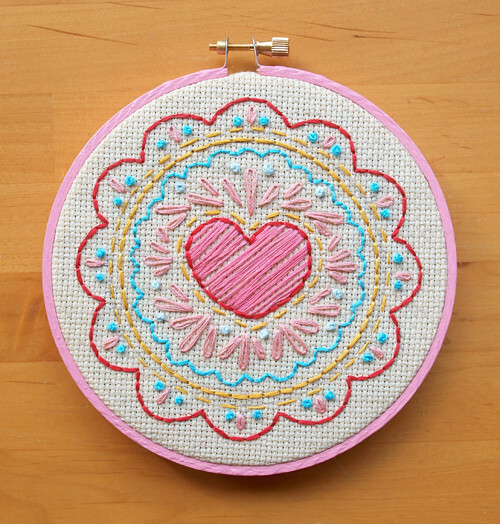 I'm going to get a hoop so I can make this and hang it tonight :) thanks for sharing this adorable pattern! Do you paint the hoop pink or can you buy them pink? So adoreable! Michelle gave the hoop two coats of paint, then a coat of mod podge. I totally want to paint all of my hoops now! this is lovely - thanks for sharing! I love this; thank you so much for sharing! And I love love week! This is so fun! 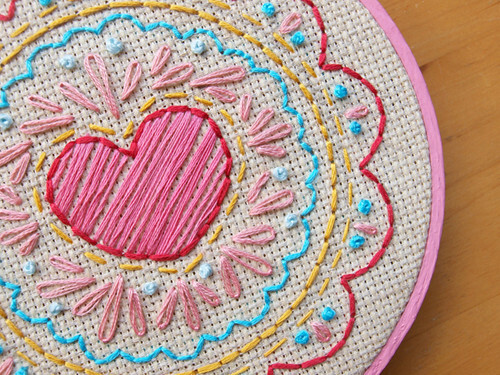 I love how the heart isn't quite all filled up with pink embroidery floss. Thanks for sharing. Love doing it on the aida fabric! darling! love it. i found this design amongst an array of others, and this one was the one that made me go 'click' and put a smile on my face. thank you. r.